Many words used in the world of accounting, finance and business have specialized meanings. In fact, some words are just made up for these professions. It is difficult to learn financial concepts, business structures, accounting principles if you don’t know what some accounting terms mean. That is why I created the My Accounting Course accounting term dictionary. This accounting glossary isn’t an ordinary dictionary that you find in the back of one of your accounting textbooks. 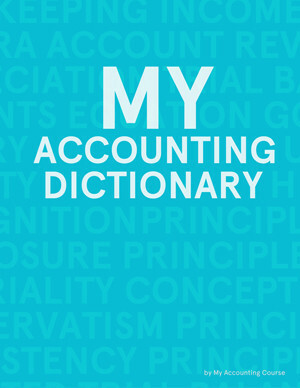 My accounting dictionary is written completely in everyday, non-accounting language, so you can understand it. I also explain each accounting term in detail and give examples of each, so you can understand the concepts behind the jargon. I think this simplified idea of an accounting glossary helps people learn terms and accounting principles faster and helps them retain the information longer. You can use either the search box or the right sidebar to find a word that you are looking for or use the alphabet at the top of the page. If you don’t see the term you are looking for, feel free to email me with any suggestions that you think I should add to the dictionary!